Supplier & Trader of Portable Dehumidifier. Our product range also comprises of Deep Freezer and Air Conditioning Services. Backed by a diligent team of professionals, we have been to supplying and trading qualitative range of Portable Dehumidifier. Range that we offer are stringently checked before their final delivery and followed by this we have emerged as one of the leading names of the domain. Our main objective is to provide quality products to our customers at compatible price. 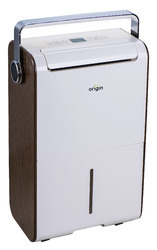 Looking for Portable Dehumidifier ?